Naftel was an artist typical of his time. Not only did he produce wonderful watercolours of Guernsey, but he also travelled throughout Europe as did many other Victorians. With the rise of the middle classes and the arrival of mass rail transit more people could afford to travel, unlike the century before when travelling abroad had been largely limited to the wealthy Grand Tourist1. Artists and writers followed the trend, conjuring up the excitement and freedom of travelling to unfamiliar destinations as did E M Forster in his 'Room with a View'. With the development of the 'Romantic Movement'2 throughout the 19th century painters, were drawn to countries such as Switzerland and Italy for their dramatic or atmospheric landscapes. 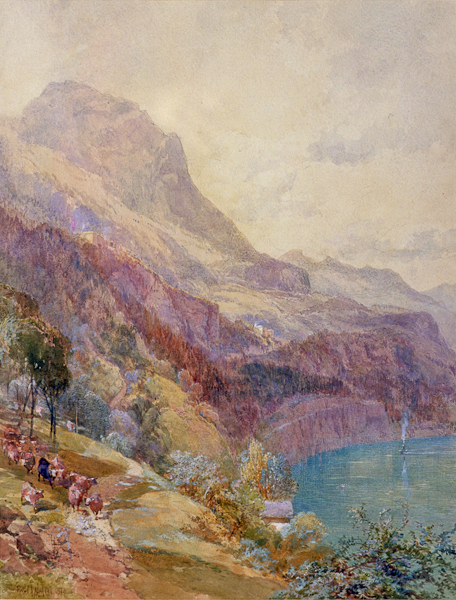 Artists such as J M W Turner used this to great effect, often emphasising the 'sublime'3 nature of a landscape as seen in his painting of St. Gotthard in Switzerland. Mostly young British upper-class men of the 17th Century who toured Europe to increase their knowledge of antiquity and the Renaissance. Artistic movement emphasising intuition and feeling. An appreciation of the fearful side of nature, seen within the Romantic Movement.